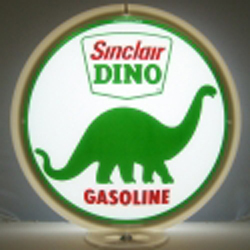 Has a 13.5 diameter convex glass lens that fits in the original style Cincinnati Advertising Products Company (CAPCO) plastic frame, patented in 1933. Frame is 16″ diameter with a 6″ base. Available in 8 frame colors: White, Yellow, Orange, Red, Green, Light Blue, Navy Blue, and Black. Please indicate choice in Order Comments on checkout. Choice of 8 frame colors.